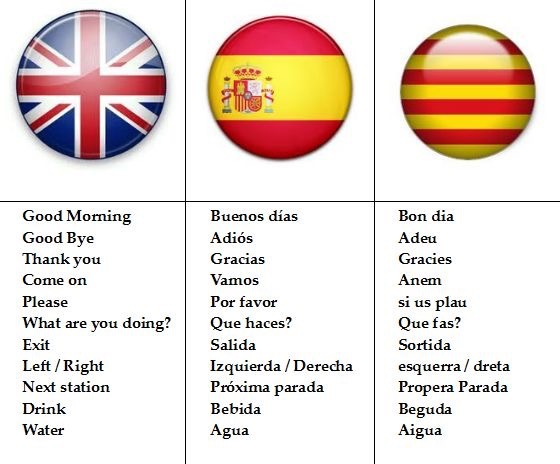 So you don’t speak Spanish or English? We headed off to Girona for the big shop. We sort of had a rough idea where we were going, and with it being a big shop we took two cars. Our plan (which was decided at the planning meeting last week) was to have a light lunch at the cafe at Carrefour, so we were not hungry when we shopped and end up getting hangry. Unfortunately the Carrefour in Girona is not as as big as the one we are used to. In UK terms, it’s similar to the difference between the size of the Tesco in Southport and the one in Burscough. If you have no idea how big the Tescos in Southport and Burscough are…well one is bigger than the other, and conversely one is smaller than the other. Anyway, the point is that there was no cafe. We entered the restafe (that’s a combination of a restaurant and a cafe. It’s a new word I have just invented. The Americans will love it. It’s simply a new word by squashing two existing words together. Neat. Efficient. Inelegant. Very American) and Nikki approached the lady clearing tables. She made that face which means “I got a D at O Level”. “Spanish?” Nikki continued. Another non-committal face. So she lives in Spain but can’t speak Spanish. This seemed weird. Then it dawned on me that Catalonia is the Wales of Spain (but without the daft hats). Having just spent a few months with people for whom English is their second language and Welsh their first; but they live about 50 miles from us, I realised that really there is no difference. The lady behind the counter spoke slowly and clearly and Nikki and Karen listened slowly and clearly in reply. I waited until she had stopped talking before I said the line that I am saying increasingly these days, “What did she say?”. Dad who was at the back of the queue was less patient “What are we doing? What can we eat?”. Mum told him that the girls would let us know how it worked once they had worked it out. I was getting a bit hangry as I hadn’t eaten since my breakfast which I had 8 hours previously but ordered 8 and half hours ago. Basically, you picked your drink, starter and dessert from the counter, pointed at the meat that you wanted, which they went and cooked and brought to you later. All for 11 euros. So our light lunch turned into a 3 course meal, so the evening menu was rapidly rewritten. Full and happy, we entered Carrefour. Dad and I had been given a list of drinks and nibbles to buy. We were both in our element with the nibbles; the crisps is the brown paper back are the best; sweet red pickled onions; bandarilla; those bags of bitty things in original, curry and chilli variants. We were like a lean mean nibble buying machine. If there’s one thing Fenner men know, it’s their snacks. Beer; Alhambra in the red can. Check. Whisky; Ballantine…obviously; Vodka. Check. We were going to have this lot done in about 15 minutes. Then we hit the problem. Wine. Myself and Dad like a bargain and with so many bottles of wine under 3 euros, where do you start? I have inherited my parents’ unenviable tolerance of cheap wine, but Nik had warned us that with her friends coming, that perhaps we had better push the boat out. So we went for bottles that should have been 5 euros and were down to 3. That’s pushing out the boat isn’t it? I have to admit I did use my wine finder app which I downloaded last week on Tibu’s recommendation. It was great for the wines, but as for the Cava, it didn’t recognise any of them. We bought bottles ranging from 2 Euro to 7 euro and to be honest, once I put them in the fridge I have no idea which were which. The Cava really has just been a lucky dip. Once we had completed our list we pushed our trolley (notice trolley singular unlike May when Tibu and myself had a trolley each) back to Nikki for checking. “We’ll go through most of those nibbles and half the wine tonight and we have two nights with nine of us. Go back and buy twice as much of it”. Begrudgingly we went back and restocked our trolley. All in all the Fenner men did ok…except for the tonic water. Apparently, if you buy two bottles of vodka you need more than two bottles of tonic water to go with it. Who knew!